Plans for a proposed £9m seafront revamp have been sent back to the drawing board by a government decision to give a pier entrance listed status. The four kiosks at the front of Boscombe Pier in Bournemouth, Dorset, are to be awarded listed status. The borough council will now have to redraw plans for a "spa village" to include the newly-protected kiosks. It says it remains optimistic that a revised scheme will get the go-ahead and will revitalise the pier area. Andrew Garratt, a Boscombe councillor, said: "The public have a clear expectation that we provide a leisure scheme on Boscombe seafront and we are determined to do just that. "We have done some work in anticipation of the listing and will be working on a revised scheme, aiming to start work on site by next September. "We remain optimistic though - a listing after all can be a draw in itself." 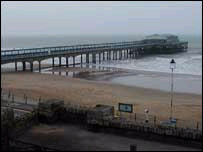 The original scheme to revamp the pier was to be funded by a planned sell-off of a car park in Honeycombe Chine to Barratt Homes for a 169-flat development. Improvements earmarked in the scheme included a shorter pier with a new entrance housing restaurants and family attractions. Heritage minister Andrew McIntosh ruled on Wednesday that the pier entrance - which dates from between 1958 and 1960 - should be listed because of its architecture. The council says it now intends to seek clarification as to what is included in the listing, reapply for planning permission and get listed building consent. It hopes to draw up new plans by February.